20121117 - UP and L took G to a bday party, J&I out for the day for bfast at McDs and then sales! We went all over town and got some great stuff. We got home in time for the buckeye game and watched most of it. 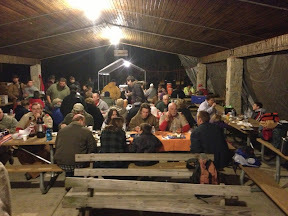 Then we all got bundled up and headed to a Thanksgiving feast with the Boy Scouts. It was a descent meal and nice ceremony. We left D there for another night out in the cold and then we got the other boys home and to bed. up late watching college football and posting things on eBay.